The fans could enjoy quite many interesting games in the last day. Here is the last day review presented by ESL. The most crucial game of the last day was another loss of top-ranked Nuggets (37-18) in Denver on Friday night. Hosts were defeated by third ranked 76ers (35-20) 117-110. It may be a crucial game in the contest for the top position in the league. 76ers made 29-of-32 free shots (90.6 percent) during the game, while Nuggets only scored twelve points from the stripe. They looked well-organized offensively handing out 23 assists. It was a good game for guard JJ Redick (193-84, college: Duke) who led his team to a victory with 34 points (!!!). Swingman Jimmy Butler (201-89, college: Marquette) contributed with 22 points, 7 rebounds and 5 assists (went 14 for 14 at the free throw line !!!) for the winners. 76ers' coach used a ten-player rotation which allowed the starters a little rest for the next games. Serbian center Nikola Jokic (209-95, agency: BeoBasket) replied with a triple-double by scoring 27 points, 10 rebounds and 10 assists for Nuggets. 76ers moved-up to second place, which they share with Boston C. Nuggets lost third consecutive game. They still keep top position with 18 games lost. An interesting game for Bucks (41-13) which hosted in Milwaukee 3rd ranked Mavericks (25-29). First ranked Bucks had an easy win 122-107. It ended at the same time the two-game winning streak of Mavericks. Greek-Nigerian swingman Giannis Antetokounmpo (211-94, agency: Octagon Europe) had a double-double by scoring 29 points, 17 rebounds and 5 assists to lead the charge for the winners and Brook Lopez chipped in 20 points and 6 rebounds during the contest. The best for the losing side was point guard Trey Burke (185-92, college: Michigan) with 18 points, 5 rebounds and 5 assists. Both coaches used bench players and allowed the starting five to rest. Bucks have an impressive six-game winning streak. They maintain first position with 41-13 record. Mavericks at the other side keep the third place with 29 games lost. They share the position with Detroit P.. Bucks will play against Magic (#4) in Orlando in the next day. Mavericks will have a break next day. An interesting game for Bulls (13-42) which hosted in Chicago their close opponent Nets (29-28). Fourth ranked Bulls had an easy win 125-106. Lauri Markkanen notched a double-double by scoring 31 points and 18 rebounds to lead the effort. Even 23 points and 6 assists by DAngelo Russell did not help to save the game for Nets. Both coaches tested many bench players saving starting five for next games. Bulls maintains fourth position with 13-42 record which they share with defeated Nets. Loser Nets keep the fourth place with 28 games lost. Bulls will meet at home higher ranked Wizards (#3) in the next day and it may be the game of the week. Nets will have a break next day. An interesting game for Kings (29-26) which played road game in Miami against second-best Heat (25-28). Third ranked Kings managed to get a 6-point victory 102-96. The best player for the winners was Buddy Hield who scored 23 points and 7 rebounds. Both coaches allowed to play bench players saving starting five for next games. Kings maintains third position with 29-26 record having just four point less than leader Toronto R. Heat at the other side keeps the second place with 28 games lost. NBA top team - Warriors (39-15) managed to deliver another win on Friday. This time they beat fifth ranked Suns (11-46) in Oakland 117-107. It was a good game for Stephen Curry who led his team to a victory with 20 points, 7 rebounds and 7 assists. Warriors' coach allowed to play the deep bench players saving starting five for next games. Warriors have a solid three-game winning streak. Defending champion maintains first position with 39-15 record. Suns lost thirteenth consecutive game. They keep the fifth place with 46 games lost. There were no big surprises in other games of day 114: Detroit P. beat New York K. on the road 120-103. Cleveland C. lost to Washington W. on its own court 106-119. N.Orleans P. managed to outperform Minnesota T. in New Orleans 122-117. The most impressive performance of 114th day was 17 points and 19 rebounds by Hassan Whiteside of Miami Heat. No shocking result in a game when third ranked Pistons (25-29) beat 5th ranked Knicks (10-44) in New York City 120-103 on Friday. Pistons made 23-of-29 free shots (79.3 percent) during the game. They looked well-organized offensively handing out 24 assists. It was a good game for center Andre Drummond (208-93, college: Connecticut) who led his team to a victory with a double-double by scoring 29 points and 20 rebounds (on 12-of-15 shooting from the field). Forward Blake Griffin (208-89, college: Oklahoma) contributed with 26 points, 6 rebounds and 4 assists for the winners. Guard Dennis Smith-Jr (190-97, college: NC State) replied with 31 points and 8 assists and center DeAndre Jordan (211-88, college: Texas A&M) added 14 points and 11 rebounds in the effort for Knicks. Five Pistons and four Knicks players scored in double figures. Both coaches allowed to play bench players saving starting five for next games. Pistons have a solid three-game winning streak. They maintain third position with 25-29 record behind leader Toronto R., which they share with Dallas M. Knicks lost fifteenth consecutive game. They keep the fifth place with 44 games lost. Pistons will have a break next day. Knicks will play at home against the league's leader Raptors (#1) and hope to win that game. The game between closely ranked teams ended with 5th ranked Cavaliers' (11-44) home loss to fourth ranked Wizards (23-32) in Cleveland 106-119 on Friday. Wizards dominated down low during the game scoring 68 of its points in the paint compared to Cavaliers' 48. They looked well-organized offensively handing out 35 assists comparing to just 21 passes made by Cavaliers' players. 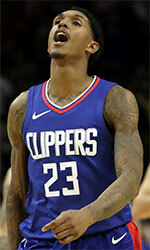 It was a good game for Bradley Beal (196-93, college: Florida) who led his team to a victory with a double-double by scoring 25 points, 6 rebounds and 13 assists. Bobby Portis (208-95, college: Arkansas) contributed with 30 points and 6 rebounds for the winners. Forward Larry Nance-Jr (203-93, college: Wyoming) replied with a double-double by scoring 10 points, 19 rebounds and 6 assists and guard Collin Sexton (191-99, college: Alabama) added 27 points and 4 assists in the effort for Cavaliers. Four Wizards and five Cavaliers players scored in double figures. Both coaches allowed to play bench players saving starting five for next games. Wizards moved-up to third place, which they share with Orlando M. Cavaliers lost third consecutive game. They keep the fifth position with 44 games lost. Wizards will face Bulls (#4) in Chicago in the next day. Cavaliers will play on the road against the league's second-placed Pacers in Indianapolis and hope to win that game. The most crucial game of the last day was another loss of top-ranked Nuggets (37-18) in Denver on Friday night. Hosts were defeated by third ranked 76ers (35-20) 117-110. It may be a crucial game in the contest for the top position in the league. 76ers made 29-of-32 free shots (90.6 percent) during the game, while Nuggets only scored twelve points from the stripe. They looked well-organized offensively handing out 23 assists. It was a good game for guard JJ Redick (193-84, college: Duke) who led his team to a victory with 34 points (!!!). Swingman Jimmy Butler (201-89, college: Marquette) contributed with 22 points, 7 rebounds and 5 assists (went 14 for 14 at the free throw line !!!) for the winners. 76ers' coach used a ten-player rotation which allowed the starters a little rest for the next games. Serbian center Nikola Jokic (209-95, agency: BeoBasket) replied with a triple-double by scoring 27 points, 10 rebounds and 10 assists and Canadian swingman Jamal Murray (198-97, college: Kentucky) added 23 points, 5 rebounds and 6 assists in the effort for Nuggets. Both teams had five players each who scored in double figures. 76ers moved-up to second place, which they share with Boston C. Nuggets lost third consecutive game. They still keep top position with 18 games lost. NBA top team - Warriors (39-15) managed to deliver another win on Friday. This time they beat fifth ranked Suns (11-46) in Oakland 117-107. Warriors had a 40-29 advantage in offensive rebounds. They looked well-organized offensively handing out 30 assists. Great defensive blocking was one of the keys in this match when Warriors made 9 blocks. Suns were plagued by 28 personal fouls down the stretch. It was a good game for point guard Stephen Curry (190-88, college: Davidson) who led his team to a victory with 20 points, 7 rebounds and 7 assists. Bahamas-American guard Klay Thompson (201-90, college: Washington St.) contributed with 25 points and 6 rebounds for the winners. Warriors' coach allowed to play the deep bench players saving starting five for next games. Swingman Kelly Oubre (201-95, college: Kansas) replied with a double-double by scoring 25 points, 12 rebounds and 4 assists and Bahamas center DeAndre Ayton (216-98, college: Arizona) added 23 points and 12 rebounds in the effort for Suns. Both teams had five players each who scored in double figures. Warriors have a solid three-game winning streak. Defending champion maintains first position with 39-15 record. Suns lost thirteenth consecutive game. They keep the fifth place with 46 games lost. The game between closely ranked teams ended with fourth ranked Pelicans' (25-31) road victory over 5th ranked Timberwolves (25-30) in Minnesota 122-117 on Friday. Pelicans made 27-of-28 free shots (96.4 percent) during the game. They looked well-organized offensively handing out 27 assists. Great defensive blocking was one of the keys in this match when Pelicans made 7 blocks. It was a good game for center Anthony Davis (208-93, college: Kentucky) who led his team to a victory with 32 points and 9 rebounds. Point guard Jrue Holiday (193-90, college: UCLA) contributed with 27 points and 9 assists (went 10 for 10 at the free throw line !!!) for the winners. Dominican-American power forward Karl-Anthony Towns (213-95, college: Kentucky) replied with 32 points and 8 rebounds and Canadian guard Andrew Wiggins (203-95, college: Kansas) added 23 points, 10 rebounds and 7 assists in the effort for Timberwolves. Five Pelicans and four Timberwolves players scored in double figures. Both coaches allowed to play bench players in such tough game. Pelicans maintains fourth position with 25-31 record. Timberwolves lost fourth consecutive game. They keep the fifth place with 30 games lost. Pelicans will face Grizzlies (#5) in Memphis in the next day. An interesting game for Bucks (41-13) which hosted in Milwaukee 3rd ranked Mavericks (25-29). First ranked Bucks had an easy win 122-107. It ended at the same time the two-game winning streak of Mavericks. Bucks dominated down low during the game scoring 82 of its points in the paint compared to Mavericks' 28. They outrebounded Mavericks 51-37 including a 41-28 advantage in defensive rebounds. Bucks players were unselfish on offense dishing 25 assists. Greek-Nigerian swingman Giannis Antetokounmpo (211-94, agency: Octagon Europe) had a double-double by scoring 29 points, 17 rebounds and 5 assists to lead the charge for the winners and center Brook Lopez (213-88, college: Stanford) chipped in 20 points and 6 rebounds during the contest. The best for the losing side was point guard Trey Burke (185-92, college: Michigan) with 18 points, 5 rebounds and 5 assists and Slovenian guard Luka Doncic (201-99) scored 20 points. Both teams had five players each who scored in double figures. Both coaches used bench players and allowed the starting five to rest. Bucks have an impressive six-game winning streak. They maintain first position with 41-13 record. Mavericks at the other side keep the third place with 29 games lost. They share the position with Detroit P.. Bucks will play against Magic (#4) in Orlando in the next day. Mavericks will have a break next day. An interesting game for Bulls (13-42) which hosted in Chicago their close opponent Nets (29-28). Fourth ranked Bulls had an easy win 125-106. They made 19-of-24 free shots (79.2 percent) during the game. Bulls outrebounded Nets 50-33 including a 42-27 advantage in defensive rebounds. They looked well-organized offensively handing out 27 assists. Finnish Lauri Markkanen (216-97, college: Arizona) notched a double-double by scoring 31 points and 18 rebounds to lead the effort and guard Zach LaVine (196-95, college: UCLA) supported him with 26 points and 5 assists. Even 23 points and 6 assists by DAngelo Russell (196-96, college: Ohio St.) did not help to save the game for Nets. Guard Joe Harris (198-91, college: Virginia) added 19 points and 5 assists. Both teams had five players each who scored in double figures. Both coaches tested many bench players saving starting five for next games. Bulls maintains fourth position with 13-42 record which they share with defeated Nets. Loser Nets keep the fourth place with 28 games lost. Bulls will meet at home higher ranked Wizards (#3) in the next day and it may be the game of the week. Nets will have a break next day. An interesting game for Kings (29-26) which played road game in Miami against second-best Heat (25-28). Third ranked Kings managed to get a 6-point victory 102-96. Kings made 19-of-25 charity shots (76.0 percent) during the game. The best player for the winners was Bahamas guard Buddy Hield (193-93, college: Oklahoma) who scored 23 points and 7 rebounds. Serbian swingman Bogdan Bogdanovic (198-92) chipped in 16 points, 5 rebounds and 4 assists. Four Kings players scored in double figures. At the other side the best for losing team was center Hassan Whiteside (213-89, college: Marshall) who recorded a double-double by scoring 17 points and 19 rebounds and guard Josh Richardson (198-93, college: Tennessee) added 21 points and 4 assists respectively. Both coaches allowed to play bench players saving starting five for next games. Kings maintains third position with 29-26 record having just four point less than leader Toronto R. Heat at the other side keeps the second place with 28 games lost.